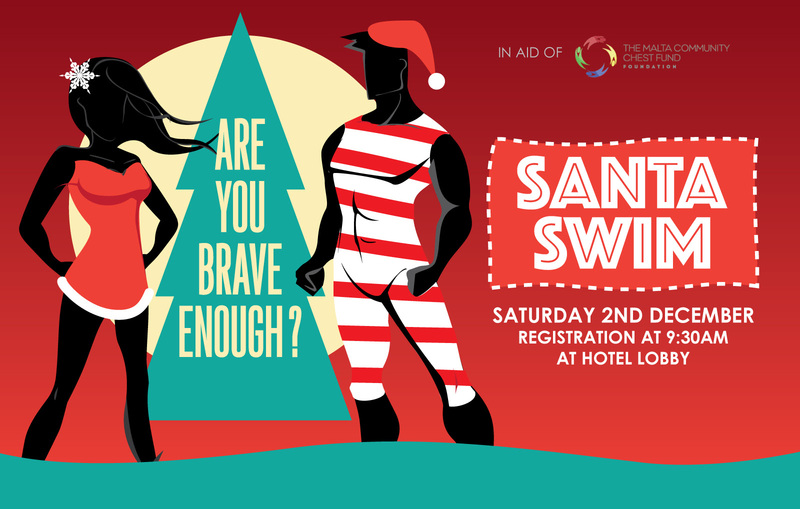 Join us this Saturday for our annual Santa Swim. As a tradition, the hotel themes its Christmas activities, and the selected concept this year is Cinderella. On the occasion of this year’s Santa’s Swim, characters from the fairy tale Cinderella will be joining as Santa’s special guests to do a brave dive for charity. Each swimmer will receive a Santa hat upon registration. We will be serving well-deserved warm drinks and home-made cookies to all participants after the swim. Facilities for showering and changing will be available. A certificate of participation will be presented to all swimmers. Those who are not willing to brave the cold water are still encouraged to come and show their support. Once again, present and former local Waterpolo players are being invited to participate in an exhibition match. At 9.30am the MCCF representatives will start collecting the donations and registering the participants. The band of the Malta Police Force will bring joy with live Christmas Carols and will be welcoming the participants at the Grand Hotel Excelsior lobby at 10am. This activity is being endorsed by the Malta Community Chest Fund and, as in previous years, H.E President Marie Louise Coleiro Preca is expected to attend. Each participant is kindly asked to make a donation of €10 upon registration in aid of the Malta Community Chest Fund. Those participating will also be in the chance of winning a Dining Voucher for Two. T&C Apply. Participants are encouraged to register for this charity event by contacting the Grand Hotel Excelsior Christmas Desk on 21250520 or email christmasdesk@excelsior.com.mt. This year, Aaron Ciantar, the 5-time World Powerboat Champion and 9-time Power Boat Builder World Champion will be attending. His World Championship boat, the 41-foot Chaudron, just back in Malta from Aaron’s latest success in Chiaggia, Italy, will be on display. The local Ferrari Owners Club will be displaying their magnificent vehicles and a track with Junior Go Karts will be set up for children from 5 to 13 years. Have a look at last year’s Santa Swim Edition. We hope that you will be able to join us this year. This entry was posted in 5 star hotel malta, About Malta, Christmas in Malta, Excelsior Hotel Malta, Excelsior Hotel Marina, Holidays in Malta, Luxury Malta Hotel, Malta Events and tagged charity, dive, events, fund raising, santa swim, waterpolo on December 1, 2017 by Denise Camilleri. Join us at the Grand Hotel Excelsior’s Lobby to usher in this year’s Festive Season. 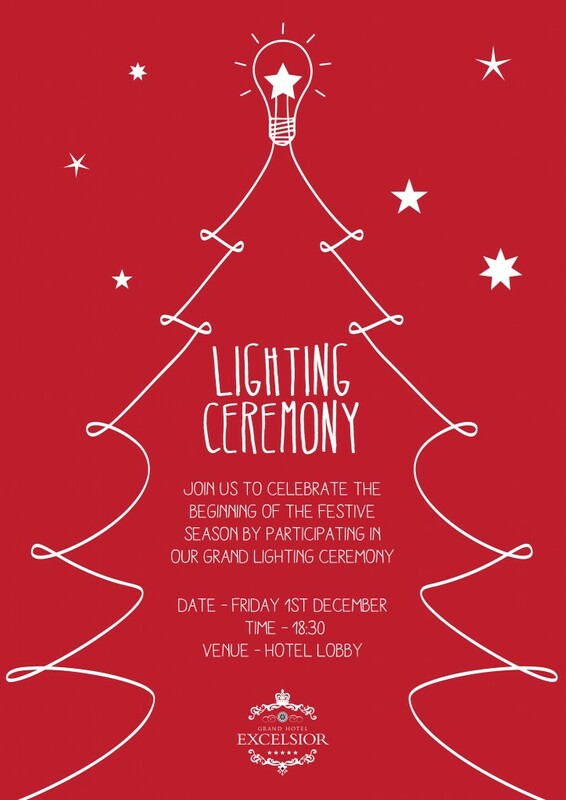 This year’s lighting ceremony will be on Friday 1st December 2017. Event starts at 18.30hrs. On behalf of the Grand Hotel Excelsior Team we wish you all the best for the festive season and the new year. Should you require any further details about our Festive Season Programme kindly visit the Grand Hotel Excelsior‘s website. This entry was posted in 5 star hotel malta, Accommodation Malta, Christmas in Malta, City Breaks Malta, Excelsior Hotel Malta, Holidays in Malta, Luxury Malta Hotel, Malta Events, Preferred Hotels and Resorts and tagged christmas celebrations, christmas in malta, excelsior malta, grand hotel excelsior malta, lighting ceremony, malta events on November 21, 2017 by Denise Camilleri.